Messe Frankfurt is concentrating its expertise in the ‘Entertainment, Media & Creative Industries’ Business Unit with the introduction of a new organisational structure. Following conceptual changes to this year’s events, the management of Messe Frankfurt is using the knowledge gained to link the Musikmesse and Prolight + Sound teams in five areas of activity. “With the strategic step of reorganisation, we are focusing expert knowledge and intensifying our working relationship with associations, exhibitors, visitors, key communicators and partners. Against the background of a changing market, we aim to offer our customers convincing arguments for taking part and gaining a wide-ranging overview of the market within the framework of the two international trade fairs”, says Detlef Braun, Member of the Board of Management of Messe Frankfurt. Michael Biwer, Director of Prolight + Sound since 2010, takes the lead of the ‘Entertainment, Media & Creative Industries’ Business Unit. In this position, he is responsible for the key account management and strategic planning of Musikmesse and Prolight + Sound, as well as international activities in the field of business. He continues to report to Stephan Kurzawski, Senior Vice President, Messe Frankfurt Exhibition GmbH. The sales activities of the two events will be combined in the new Sales & Planning department, which will strengthen the focus on potential new market and customer segments in addition to high-grade customer support, planning and organisation. The department will be headed by Michael Biwer until a permanent appointment has been made. Wolfgang Lücke moves at his own request from the sales field to the new Special Events & Entertainment department. In his position as head of department, he will be responsible for the programme of events at Musikmesse and Prolight + Sound, which ranges from special information and training events for trade visitors to the programme of entertainment at the Exhibition Centre and in the city. Under Binu Thomas, the Business Relations department will further develop the retailer and key communicator management with the emphasis on targeted measures to activate national and international trade-visitor potential and communication with the various associations. Additionally, the Business Relations Department is responsible for acquiring external sponsors. 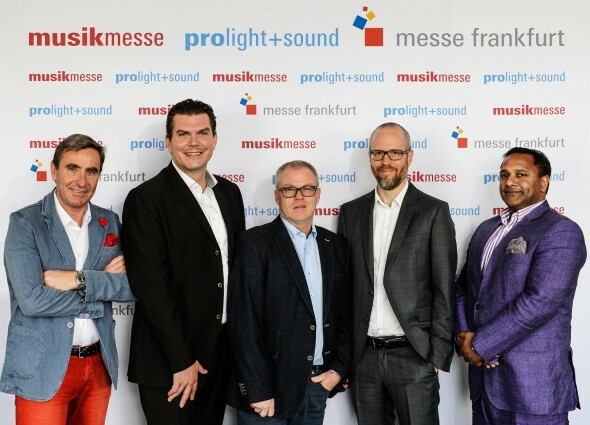 The expansion of the media coverage of Musikmesse and Prolight + Sound, as well as the advertising and PR measures for both events continue to be the focus of the Marketing Communication Department. The communication team of the ‘Entertainment, Media & Creative Industries’ Business Unit continues to be headed by Christopher Sparkes. The next Musikmesse will be held from 5 to 8 April 2017 (Wednesday to Saturday) and Prolight + Sound will open its doors from 4 to 7 April (Tuesday to Friday), thus giving visitors the opportunity to attend both trade fairs on three full days. Musikmesse is the International Trade Fair for Musical Instruments, Sheet Music, Music Production and Music Business Connections. Ranging from classic instruments, guitars and basses, wind instruments and percussion to electronic equipment, the spectrum to be seen covers all products for musicians. Prolight + Sound is the International Fair of Technologies and Services for Entertainment, Integrated Systems and Creation. Its exhibitors present products and services for the fields of lighting and stage technology, audio and PA systems and AV media technology. This year, around 2,000 exhibitors from 60 countries made presentations at the two trade fairs in Frankfurt am Main.